It may be a bit of a slow time in sports, but there is always something to think about. -How many games should you win in any level of football if you have the best quarterback and receiver on the field every game? This goes for little league, modified, high school, college or the NFL. Answer is most games. Looking at the UB schedule this year I think they will have the better QB and receiver in every game this year. Thank you Tyree Jackson and Anthony Johnson. – The closer we get to training camp the less enthused I am about Nathan Peterman potentially being the Bills starting QB. He simply doesn’t have the arm talent to be a starter in this league. I’d accept AJ McCarron but Peterman would leave me wanting the Bills to rush Josh Allen along quicker. -Reports are that Vlad Guerrero Jr. is ahead of schedule in terms of coming back from his injury. Reports were the Jays were going to promote him to Buffalo before the injury. Can’t wait to see him mash the ball here. The 19 year old was hitting over .400 with 11 homers and 55 RBI’s through 53 games in double A. -Speaking of baseball the Red Sox need to add a set-up man in the worst way. Joe Kelly is not going to cut it against the Yankees or Astros in the post-season. The Yankees need to add a starter. 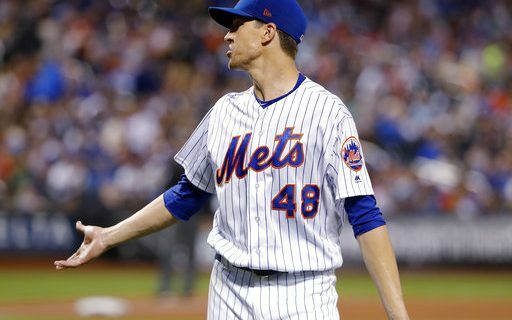 Will the Mets really trade Jacob deGrom across town? Can’t see it, that’s totally goes against what the two organizations history. -Why isn’t the US better in soccer? Is it because at a young age they are coached? They don’t practice the one on one skill on their own. Forget tactics, the best players in the world will use speed and skill to take a direct line at the goal. US kids need to spend more time on their own working in the back yard with a ball just practicing their one on one skill. -The NFL should have suspended Jameis Winston and Ronald Darby this week. Darby lied to the public when he rushed to Winston’s defense late last year. Winston’s bizarre admission/non-admission of guilt this week shows both men were lying when they came out last year and totally rejected the Uber driver’s story of being inappropriately touched by Winston. -Darby not being on the Bills is another example of how Brandon Beane and Sean McDermott want only high character guys on the roster. Many Bills fans on social media want the Bills to go out and get Dez Bryant to help the Bills poor receivers. Never going to happen. -Great to see UB hosting Stanford at Alumni arena this December for women’s hoops. Tara VanDerveer coming home is an added bonus to show how respected this UB team is after a sweet sixteen run last year. Coach Felisha Legette Jack looks like she is going to challenge her team this year with a aggressive non-conference schedule. -Statistics showed that 95 percent of the time last year Jack Eichel either had Jason Pominville or Zegmus Girgensons as his line mates. That’s not going to cut it. Now that the defense appears to be in better shape with Rasmus Dahlin, getting Eichel someone that can keep up and put the puck in the net has to be the priority. -Time to sit down for my summer reading. Phil Steele’s mammoth college football preview magazine is in my hands. Hopefully I will be done with it by September. For more entertaining thoughts from the always excitable Bob Gaughan, visit his author’s secton at Buffalo Sports Page.